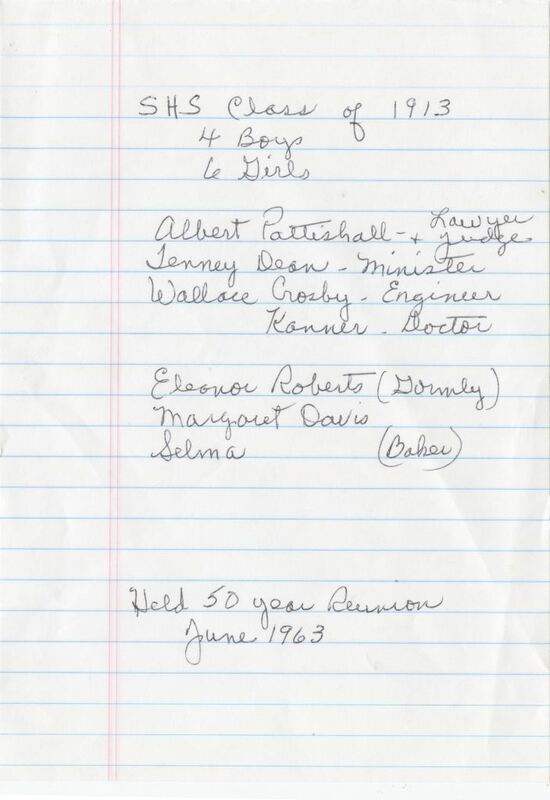 A handwritten note listed the graduates of the Sanford High School Class of 1913 that attended the 50 Year Class Reunion held in June 1963. The graduates included: Albert Pattishall, lawyer and judge; Lenney Dean, minister; Wallace Crosby, engineer; Konner, doctor; Eleanor Gormley Roberts; Margaret Davis; and Selma Baker. The note was likely written by Luticia "Tish" Gormley Lee. Original note, June 1963: Private Collection of Luticia "Tish" Gormley Lee. 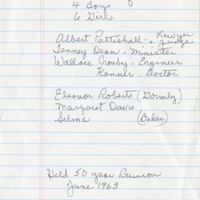 Digital reproduction of original note, June 1963. “Sanford High School Class of 1913.” RICHES of Central Florida accessed April 24, 2019, https://richesmi.cah.ucf.edu/omeka/items/show/3089.